Nearly three years after General Motors (GM) unveiled the Chevrolet Volt as a concept vehicle, the resurgent automaker Tuesday took the wraps off the final production model that will begin shipping to dealers next month. CEO Daniel Akerson said the Volt's introduction marked the beginning of the increasing electrification of the automobile. How fast and the extent to which the technology will be deployed will play out in coming years and decades, Akerson said during a celebratory event at the company's Hamtramck Assembly plant where the Volt is built, marking the vehicle's official introduction. "I think 20, 30 years from now, we'll look back at this car it will be something maybe like the model T was in the early 1900s," Akerson told CNBC. "This is the first huge step." 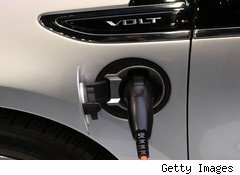 GM said 200 cars available for retail sale have already been built and will be sold in markets targeted for the Volt's initial sale -- California, Connecticut, Michigan, New Jersey, New York, Texas and Washington, D.C. The car carries a sticker price of $41,000 that can be reduced by a $7,5000 federal tax credit. Environmental Protection Agency estimates show the Volt is capable of achieving the equivalent of 93 mpg. In the world of vehicles that use some form of battery technology for propulsion, the Volt is unique. Unlike Toyota Motor's (TM) Prius, which relies on its gasoline engine to recharge its battery, the Volt can be plugged into an ordinary household outlet. And unlike Nissan Motors' (NSANY) Leaf, a pure electric vehicle, the Volt can travel vast distances, thanks to its gasoline engine, without having to recharge. Still, as Akerson noted, the Volt is capable of operating solely as an electric-only powered vehicle. It was designed to go about 40 miles before its battery pack needs recharging. GM says that distance is within the range of most Americans' daily commutes. GM has committed to building 10,000 Volts during its first year of production and increasing that number to 45,000 units in 2012. Asked if the company would consider building more than that number, Akerson said the company will be eyeing demand. "I have a sense that this is going to be a ... game changer," he said. "And we have to be prepared to meet that." Akerson added that GM may need to be prepared to build as many as 135,000 Volts. During the presentation, Akerson said GM would hire 1,000 additional engineers in the Detroit area to work on battery technology, with most of the positions to be created at its Warren technical center north of Detroit. The engineers will develop batteries for various applications, including future hybrid, electric and hydrogen fuel cell vehicles. The commitment expands on the more than $700 million GM has invested in eight facilities in Michigan to support Volt production, GM said in a statement. Tuesday's event also marked the return of Bob Lutz, who oversaw design at GM for more than eight years before being relegated to an advisory role in December 2009 by then-CEO Edward Whitacre and finally retiring in May. Lutz said the Volt has the potential to change GM's image to a more environmentally friendly one, especially among consumers on the country's East and West coasts, where American vehicles have long fallen out of favor. Lutz credited GM's engineering staff for bringing the Volt concept to reality, saying that only GM, with its vast repository of technical skill, could pull off developing a vehicle as complex and innovative as the Volt. Shares of the automaker, which had headed lower in early trading Tuesday on Wall Street, inched up shortly after the event concluded. At midday, GM stock was trading slightly higher, at $33.97 a share.